Hourly Rounding, also known as proactive or comfort rounding, focuses on anticipating and addressing the patient’s most common needs. They are categorized by the four P’s: potty, positioning, pain, and periphery. In addition to making the patient comfortable, the nurse does an environmental scan for safety while in the room. 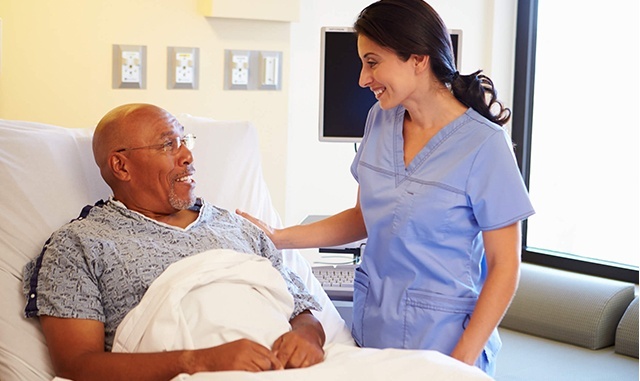 By anticipating the patient’s needs and performing safety checks, organizations see improvements in both the nurse responsiveness and safety domains. In some cases the result is a 40% increase in responsiveness and a 60% decrease in fall rates1. View our On-Demand Patient Experience Webinar! Combining the bedside shift report and hourly rounding to your daily processes is a one-two punch for improving quality, safety and the patient experience. Here are a few suggestions on how to put it into practice within your hospital. Consistency is a fundamental piece to making a positive impact on scores using hourly rounding and bedside shift reports. Standardizing processes guarantees that there is consistent and repetitive execution by all team members. Patients know what to expect and it’s easier to measure who is doing what and what works and what doesn’t. Make the patient part of the process. Patients are a central part of the process, which makes it vital that they are part of your process. From day one, they need to know what to expect from their caregivers. For hourly rounding, let them know you will check on them every hour during the daytime and scale it back a bit at night so that they can get their rest. For the bedside shift report, explain what it is and how they can be part of the process. Implement technology that supports your efforts. A mobile rounding tool is a great resource for standardizing your hourly rounding and bedside shift report processes. The use of a workflow technology will confirm that the critical components of both are consistently executed and all communications are tracked in one central location. Measure, improve, and measure again. Once you have your processes and technology in place, you need to measure your success and identify areas for improvement. Continuous improvement is crucial to improve patient experience scores. Measuring your process will validate the benefits of hourly rounding and the bedside shift report. The good news is you don’t have to look too far to find a technology that fulfills can help you implement your winning combination for top box success. CLARIFIRE HEALTH® offers an easy-to-use mobile application that is as simple as Tap, Swipe, and Go. Intuitive usability combined with a robust workflow engine capture metrics, preferences, and trends in real time. Paper processes are eliminated, issue escalation is automated, and solid reporting is available with just a few quick clicks.